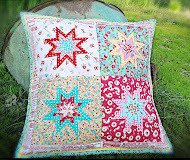 lovely little handmades: a tutorial~ simple patchwork and stars! a tutorial~ simple patchwork and stars! The finished size measures 51 1/2 X 60 inches. Lets cut our pieces...Cut 120, 3 1/2 inch squares for the patchwork, 49, 6 1/2 X 3 1/2 inch rectangles, 7, 3/12 inch squares of red and pink, 56, 2 1/2 inch squares of red and pink, and then 6, 3 1/2 inch squares of aqua, and 48, 2 1/2 inch squares of aqua. 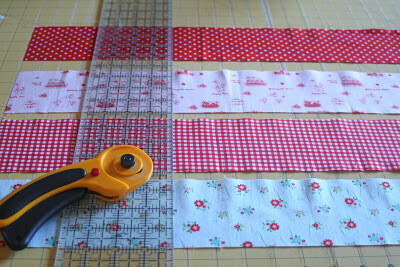 To go faster I cut 4 rows at a time. For the fussy cutting I use a 3 1/2 inch square (from Joanns), to make it easier to get the images centered. Lets now make our first block. 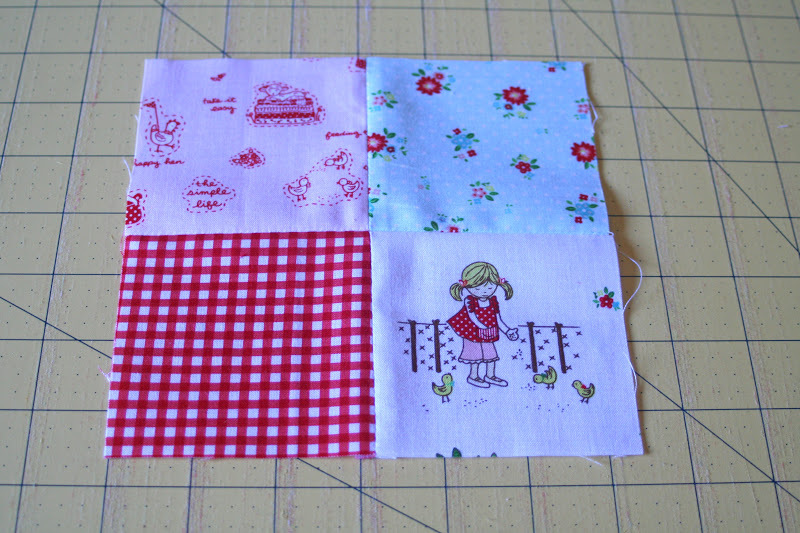 Stitch 4 squares together. 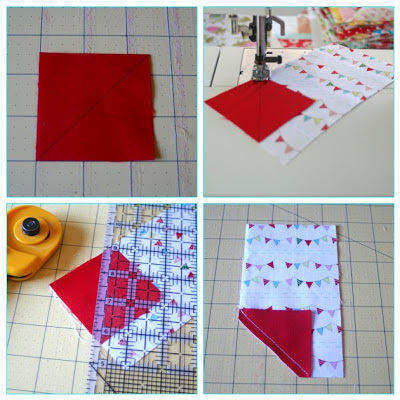 To make the star part, draw a diagonal line with a pencil or pen on the 2 1/2 inch square. 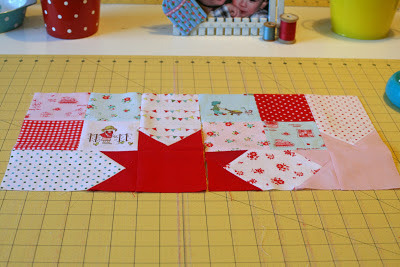 Then place the square on one side of one of you 3 1/2 X 6 1/2 inch pieces. 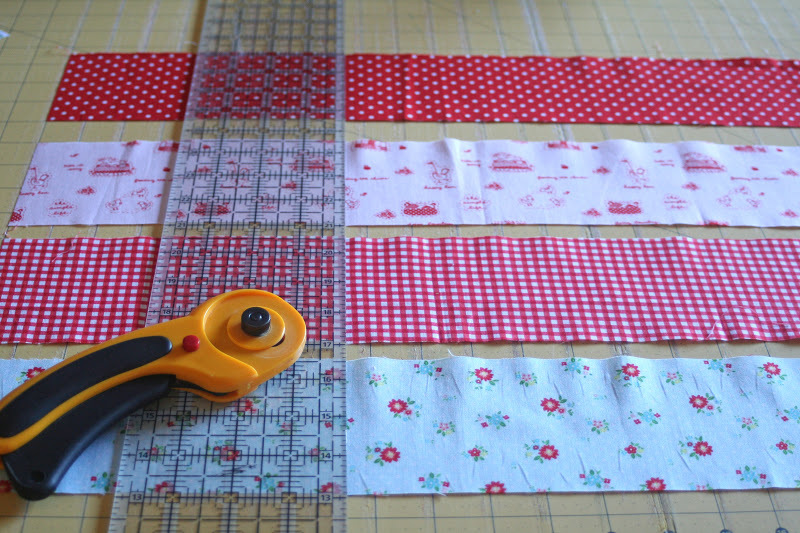 Stitch on the line and then with your rotary cutter, cut a 1/4 inch seam. Press seams open. Now continue as above and stitch the other side. Continue and do another 3 1/2 X 6 1/2 inch piece. 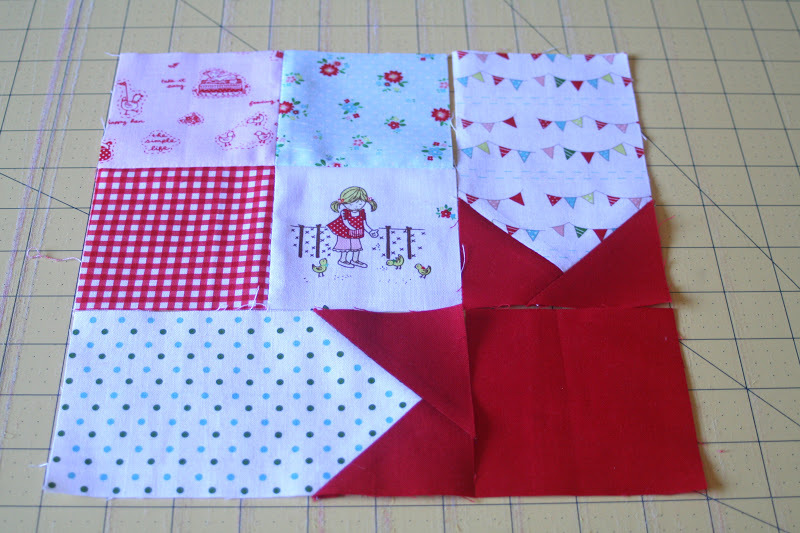 Then place your 4 pieces out to make your first block. Stitch your top to pieces together. Stitch the bottom 2 pieces together and then stitch the top and bottom pieces together to make your first block. Now we have all our blocks together. It is pretty simple, right!?! 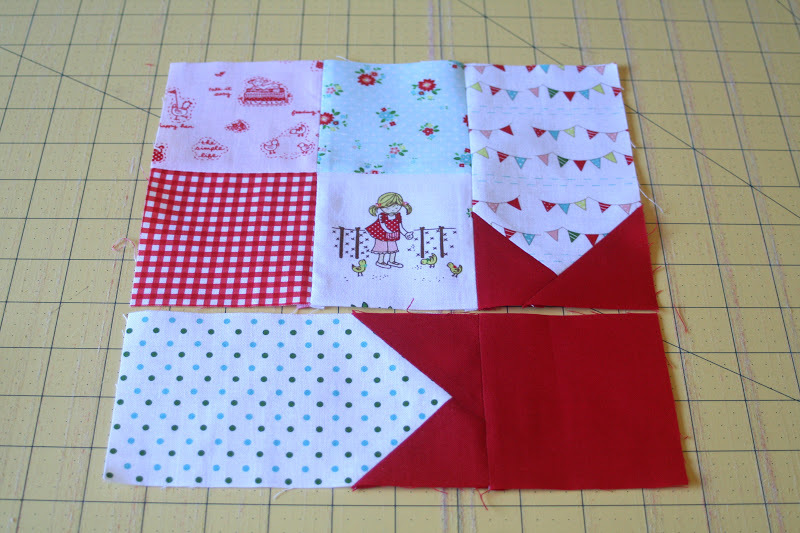 Stitch the quilt top together by sewing the blocks into rows and then your rows together. 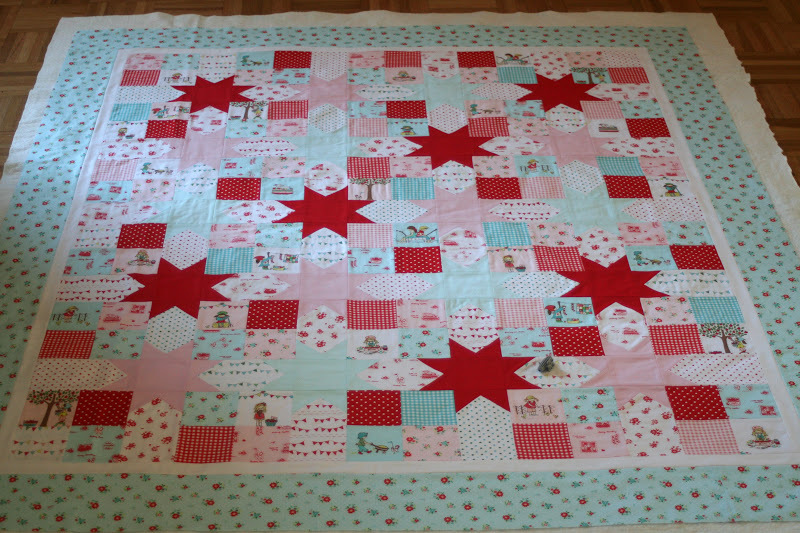 Yeah, the quilt top is done! Now all you have left is to add a 1 1/2 inch white border, your 5 1/2 inch border, then sandwich, quilt and bind your quilt!! Isn't that fun and easy! I hope you enjoyed the tutorial! Thank you! 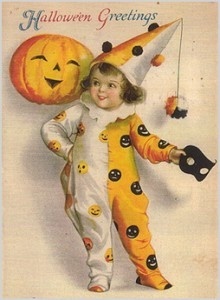 I pinned it for future reference! This is beautiful! Thank you so much for the tutorial. 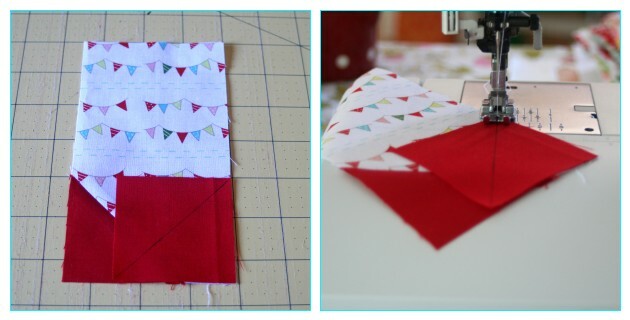 I actually made a similar quilt from a book but the way you have shown it looks a lot easier! 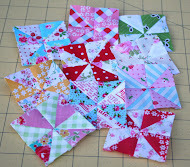 The one I did had me do the 4-patches and then the other parts were done as sashing rather than part of the block. I think I'll do another using your method. thanks for the tutorial! I pinned you! 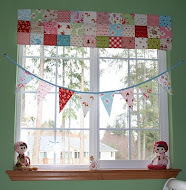 :) Great tutorial and pretty quilt. 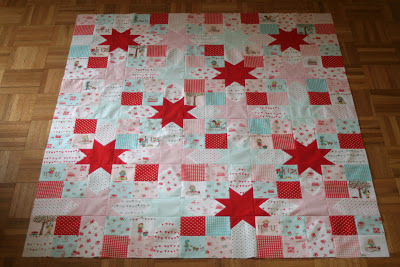 I love patchwork and stars. Thanks for sharing. In the cutting instructions, is 7 3 1/2 inch squares? Your quilt is beautiful! 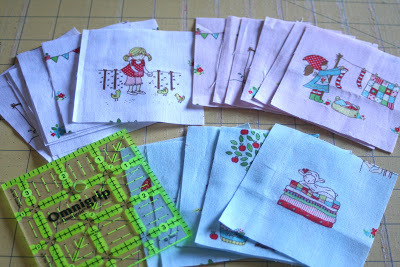 I work with AllFreeSewing and have been trying to contact you. Please email me if there is a good way to reach you. Thanks! I'll email you. For future reference, the best way to contact me is through the etsy convo feature. 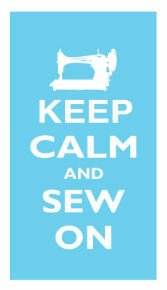 Also, you can email me at sewdeerlyloved@hotmail.com. Though sometimes my email gets a bit backed up. Love this! 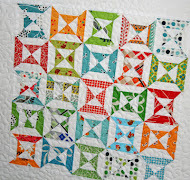 I am working on a Radiant Ring quilt right now in the same colors, with the Simple Life print fussy-cut for my centers. 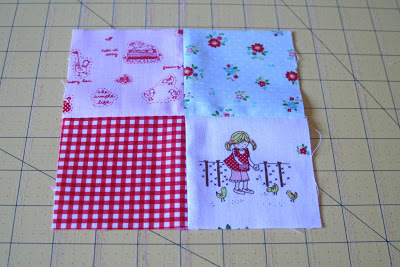 Unfortunately, they're 4.5" square which is just a little too big for the print -- I end up losing a lot of the motifs. But I just bought more and cut the ones I like best. 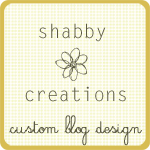 :) Thanks for the lovely inspiration -- the colors are amazing -- now I can't wait to get mine finished! 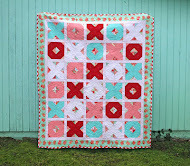 This is such a beautiful quilt and a wonderful tutorial! 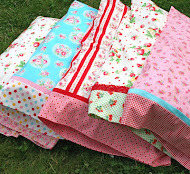 Just wanted to say too that my parcel of Simple Life fabrics from you has arrived safely across the pond! Thank you so much, Kerri, they are gorgeous! I absolutely love this! How wonderful would it be in Christmas colors! 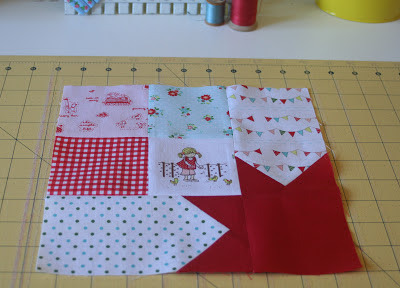 Love this quilt, thanks so much for the tutorial! Wow, Kerri, you are brilliant! I love, love, love this quilt. Thank you so much for the tutorial, I will be making this for sure! Oh Kerri, I received those darling prints (that I won in your last giveaway). They are THE cutest things! I am so overwhelmed by them. They are by far the best thing I have ever won... EVER! I feel so very blessed. I can NOT wait to use them, but am having a hard time coming up with something "worthy" of them! lol As soon as I do, I will definitely post on flickr and send you pics. Thank you soooo very much! They are looking so beautiful. Patchwork is my favourite. I will do this for table mats. Kerri, your quilt is so gorgeous! I love every single thing about it, and your wonderful tutorial too. Just lovely! I have some questions though : which quantity of fat quarter do I need exactly ? If I buy the bunde of 18, will I have some leftovers ? Thanks again for your time and your wonderful inspiration ! 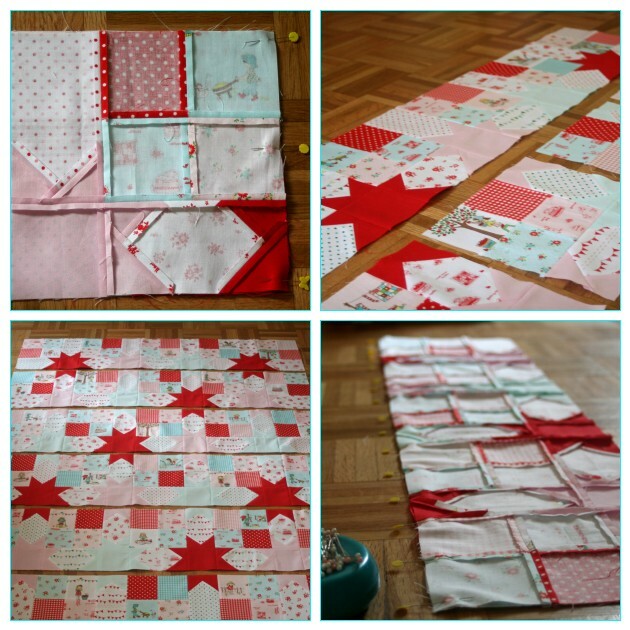 Great Tutorial and such a beautiful quilt! Do you know the finished size? 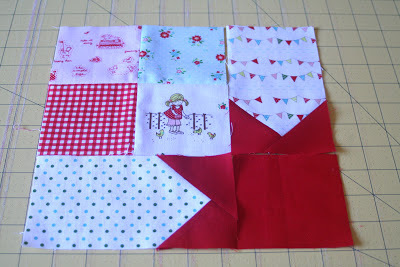 I would like to make a lap quilt for my mother using your tutorial but can't seem to find what's the size. Thanks for your help and for sharing so much! I'd love to know the finished size as well. 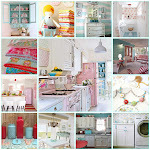 Also can you say specifically what you used for your red, pink and aqua. Thanks! 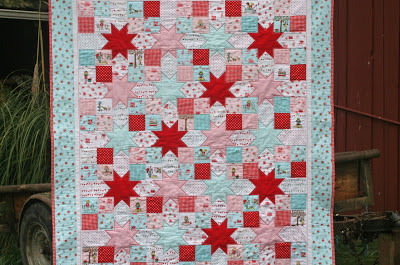 This quilt is seriously so cute! 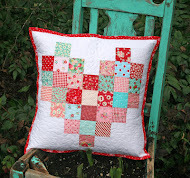 Love this quilt and I just bought the fat quarter bundle from you. Would like to look for the red, pink and aqua online as well. Do you know what colors/ brand you used for those? Thanks!! Love the quilt & the tut! Thank you very much. 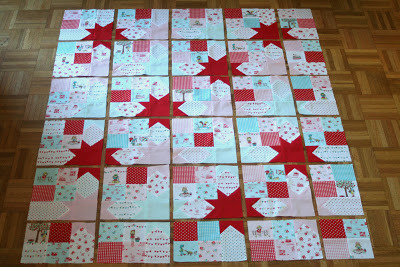 I am going to teach a friend to make this quilt as a 50th wedding anniv present for her parents. Using layer cakes and charms from the Tapestry collection. I am thinking she will need to trim the layer cakes down to 8.5 to have the charms used for the points. Your pics motivate me! Just purchased the bundle. 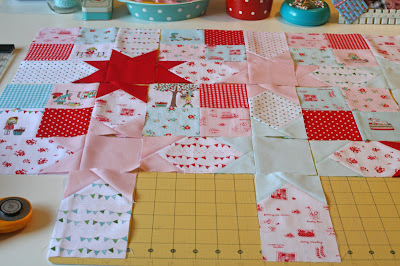 So excited to make this quilt! Uuuuaaaaauuuu!!!!!!!!! 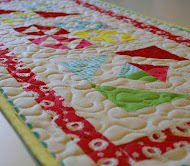 I love this quilt!!!!!!!! Is wonderful!!!!!! 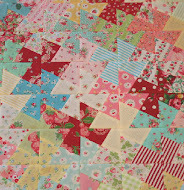 I would love to have these patchwork quilts for my bed. Because I just love your post. what say???? Beautiful!!! 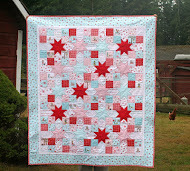 This is the best pattern ever for stars. Thanks for sharing! Im a patchwork noob but have saved fabric from my daughters dresses and want to make her a quilt as beautiful as this before she leaves home. how do i know if i have enough fabric of each type?Any help welcome! simple stars and patchwork quilt! 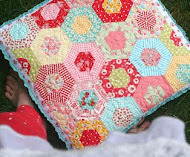 easy double hexagon pillow tutorial! 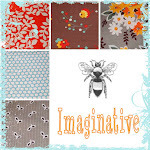 wallpaper dreams & a winner!